Replace your default inventory's list view with a more compact grid view! The default list view shows 11-12 items at a time (in my case), so it can become a pain to navigate your inventory. Grid view sacrifices detailed information for more pictures. Sometimes you want the detailed information, so I've included a keybind that will toggle the grid on and off. 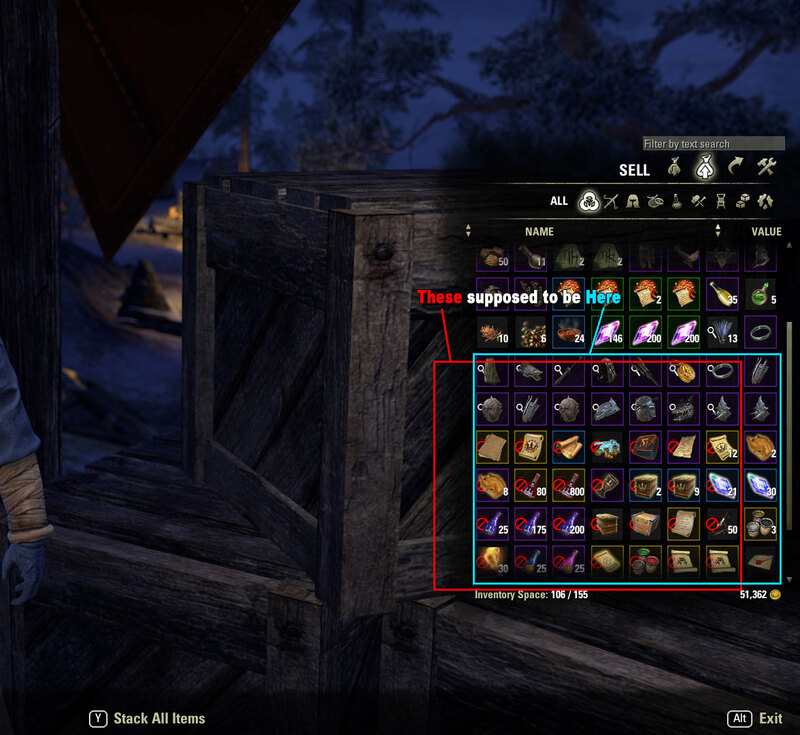 Grid view for your main inventory, your bank, your guild bank, your craft bag, NPC's stores, AND the buyback screen! Toggle grid view on and off! Useful for when you need to scan with more information. Four default skins to choose from, with more available for download. Offsets item tooltips so they do not cover up the grid (can be turned off). Set scale of item icon animation. Works with Advanced Filters and other inventory addons such as Item Saver and AlphaGear! - known issue: When switching from grid to list view, items in the list will not be anchored correctly. Reloading the UI while list view is active will produce a correctly anchored list. - removed Homestead hax. 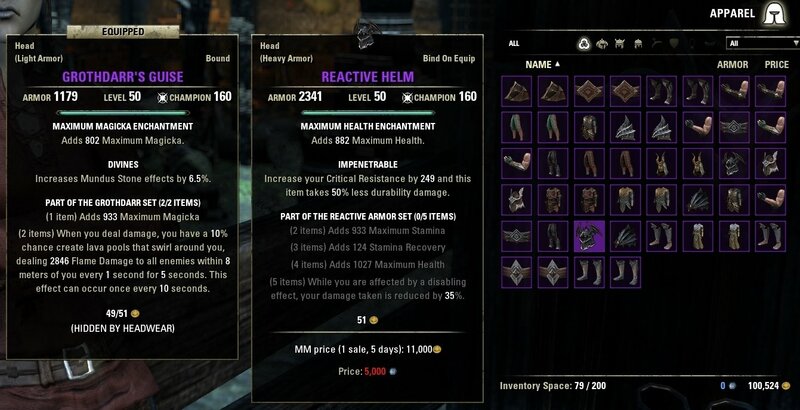 You can now use your inventory as you could before this whole debacle. - fixed and re-enabled the currency tooltip. In the craft bag and NPC stores, tooltips will be appended with the items value. Ex: "Price: 500g"
- corrected problem with moving items through keybind. Previous method for changing tooltip anchors caused normally protected code to be executed in an unprotected context, producing the error everyone saw. Thank you to merlight for the suggestions and showing me the custom tooltip function! - fixed item tooltips to the beginning of the row. 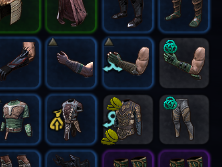 No more covering up the item grid! - ZOS renamed slot control child "NewStatus" to "Status" -> updated as needed. - Added Grid View to the quest, vendor, and buyback menus! -The example grid box in the settings menu will now react again to mouseovers and outline toggling. -Updated to LibAddonMenu-2.0r6 - this will put the dropdown menus back in the correct order. -Updating LibAddonMenu-2.0 broke part of the functionality of the "example" in the settings. The basic part of it still works, and that's all that's really necessary. -I'm tired of adding skins, so I wrote a function to register them with an external add-on. Please see the template for more details. -Icons from other addons that rely on the row's "isGrid" property should now behave properly; this includes Research Assistant. -The sample icon in the settings menu now properly reflects what skin you choose. -Fixed a bug where AddGold would throw an error. This won't completely fix the error that everyone is talking about, because the bug is in ZO's code. -Gold should no longer randomly stop being hidden in grid view. -Hopefully fixed an issue with Research Assistant's icons sometimes being shifted to the right. -Updated to the most recent revision of LAM. -Fixed a compatibility issue with Research Assistant. This version or later is required for Research Assistant to integrate properly with the grid. -Added Rushmik's skin to the add-on. -Added setting for skin choice in the settings menu. -Added toggle for gold on the tooltip in the settings menu. -Reset settings. Defaults are now to the Rushmik skin with minimum magic quality to "Magic". -Attempted to fix a problem where some users would see the sell value control in Grid View. -Tooltips will now add a line with the value of the stack. -Added a "minimum quality" option for the outlines. -Fixed the bug that ruined list view when changing grid view settings for inventories that have it disabled. -Moved the toggle button back to its home in the bottom of the window. -Settings window added under SETTINGS menu! -Added a real icon to toggle grid view and moved it to the upper left-hand corner of the inventory window. -Added a custom mouse-over background for the grid view that is colored by the rarity of the item. This is still colored when the outline is turned off. -Removed the slash commands. Now you can use the SETTINGS menu. -Added a slider to customize the size of the icons in the grid. -Fixed a bug where the grid wasn't properly calculating the spacing between grid icons. The grid should now fill the window. -Fixed a typo that made the guild bank not work. -Fixed an issue where I was indexing the bags with the wrong global constant. As a result, the guild bank should now be grid view-able and the scrolling should now work correctly in the bank. -Integrated the grid view to the player bank and guild bank. If I want to set quickslots and press slottable Quest Items then this error will appear. Then everything disappears. Only chat remains. Last edited by KLISK : 03/16/19 at 10:19 AM. Recently I get this error & then everything apart from my experience bar disappears on my screen & I cannot do anything, forcing me to /reloadui. Last edited by Voidheart : 02/26/19 at 05:44 AM. Hi - I recently returned to the game and have found that using 'grid view', both with my inventory and bank, the game's default icons, that were introduced in the 2017 Clockwork release, now sit offset to the left of each relevant grid cell, rather than on the cell. This causes a confusing mess. Is there anyway to stop this - preferable delete the little tykes (I would rather just use the Item Saver system)? Is it a problem resulting from the most recent release? Update: Just read comment by "Provision" below. If my problem is the same as the handshake error with Autocategory, as alluded to, where in the Autocategory lua file would the additional text be placed - I assume that it would be somewhere in the "AutoCategory_Integrations_Inventory_Grid_View.lua" file. Last edited by Zalaan : 02/26/19 at 01:24 AM. Hi I was wondering if there is anything that can be done about the performance when using this addon. When opening my inventory or bank there is a big pause and scrolling with mouse wheel causes the fps to drop to single digits. Scrolling by grabbing the scroll bar is nearly impossible as it makes the whole game just freeze. I have tried disabling all other addons but the problem remains. Is this normal ? I really like this addon and would prefer to keep using it. Last edited by boxanata : 01/24/19 at 10:49 PM. But even after recent update, It still exists. Item trait icon is not located where it supposed to be. You can find this glitch at vendor's selling section. Except this glitch, Inventory Grid View is an awesome add-on. I've been having this same issue for a while now, did you ever find a fix for it? Last edited by Provision : 01/06/19 at 07:26 PM. I have this glitch, too but I think this happens because of AutoCategory is also loaded as addon. Can you confirm this? The glitch goes away when I disable AC. As I can see, AutoCategory has copied some sources from IGV and override some functions of this addon. I guess from there comes the trouble. Last edited by nightmonkey : 12/17/18 at 02:43 AM. Could we get implantation for housing chests as they aren't affected by this addon. 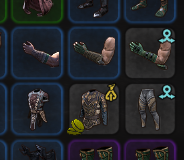 Weirdly though, my bank has grid-view working WITH auto-category addon, but not my inventory - anyone know how I can fix this? everything works fine (bank,craft bag) but not the regular bag. tried uninstalling and reinstalling, no change. changing settings ingame didnt help either. I do not use and have never used auto category. Last edited by Cocoa Pup : 12/06/18 at 04:22 AM. Can we have a group by type in the inventory? That way when I view my bank all potions are grouped together all of the same type legs, chest etc items are all together. The way things are currently is you can only sort by name or value. Having type grouping would neaten things up. If this can be done via another plugin can someone tell me what is needed, thanks. I had a look at Advanced Filters but it's not exactly what I was after. I'm talking about a sort inventory by type button rather than a filter. Last edited by drguild : 12/03/18 at 10:57 PM. Getting a few issues with this. On the quest item Iliac Bay Psijic map it crashes the UI with this error. Hopefully the dev can fix all these bugs soonish as crashes from various plugins means I need to reload the UI everytime it happens.